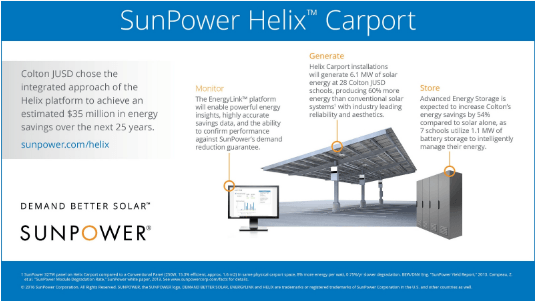 Colton Joint Unified School District (CJUSD) and SunPower Corp. are celebrating the upcoming construction of SunPower® Helix™ carport systems at 28 schools with a kickoff event at Grand Terrace High School on Saturday, Sept. 24. The Colton Joint Unified School District serves the educational needs of more than 23,000 students, grades K-12. It includes 18 elementary schools, four middle schools, three comprehensive high schools, one alternative school, one continuation high school and a preschool center. CJUSD covers an area of 48 square miles of mostly San Bernardino County in Inland Southern California and includes all or parts of seven different cities. CJUSD leadership places a high value on community involvement and collaboration between employee groups.